The dreaded “fiscal cliff” of government spending cuts and tax raises that was to take effect on January 1 has been averted for now, thanks to an agreement by the White House and Congress reached last week. Congress and the Obama administration have only temporarily averted the “cliff” by about two months when they will return to the issue of sequestration – the automatic, across-the-board federal spending cuts. For now, the agreement that was reached calls for ending a payroll tax “holiday” that reduced the tax by two percent; establishing permanent tax relief for low-income and middle-class families and extending federal unemployment benefits. Tax cuts will end for individuals with incomes of $400,000 or more ($450,000 for couples). Although Social Security and Medicare were left pretty much intact, the entitlement programs may very well be on the table when Congress takes up the issue again. These two key programs were the topic of much analysis – and some hand wringing – at last November’s annual meeting of the Gerontological Society of America. The 65th Annual Meeting, held in San Diego, brought close to 4,000 people together – the country’s largest interdisciplinary conference on aging – to network, present and discuss new academic and medical research, and policy issues directly related to the fiscal crisis. Social Security, created during the Great Depression, provides workers a basic level of income once they retire, in addition to disability pay and life insurance before they retire that provides income to the surviving spouse and their children. In fact, almost half of Social Security beneficiaries in African American and Latino families are covered by these disability and survivors benefits, compared with one-fourth of whites. Cuts to the program have been touted by Republicans, in particular, to help trim the $16 trillion national debt. However, because workers automatically pay into the system and their contributions are matched by employers, the program does not add to the deficit. Medicare, which provides health coverage to persons age 65 and older and those under 65 with permanent disabilities, was established in 1965 as part of the Social Security Act. Steven P. Wallace, a researcher with the University of California, Los Angeles CLA Center for Health Policy Research (UCLA) since 1980, was one of many speakers who put a human face on the issue of aging for the participants. In 2010 elders numbered 40 million people in the United States; that number is expected to double by the year 2040. 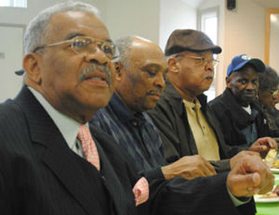 Currently, 20% of those elders are people of color, and that number is also expected to double by the year 2050. While an increase in longevity has been seen in the U.S. and other parts of the world overall – life expectancy has increased in general from age 47 in 1900 to more than age 78 today according to the Centers for Disease Control. According to Wallace’s research, wealth is not equally distributed and income has declined in the past year for African Americans and Asian Americans in the “Baby Boomer” age range (born from 1946 through 1964). This group also had the highest level of income decline. Half of ethnic elders in the U.S. are in poverty or close to it, Wallace said, and they have the least amount of reserves to fall back on; they are the most impacted by economic uncertainties. U.S. Rep. Karen Bass, D-CA-37, who represents much of South Los Angeles, expressed excitement about portions of last week’s fiscal deal that was reached with Congress, but she was also worried about its implications for many of her constituents. Thandisizwe Chimurenga wrote this article as part of the MetLife Foundation Journalists in Aging Fellowship, a program of New America Media and the Gerontological Society of America.